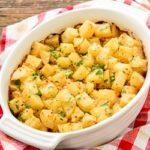 Creole Spiced Potato Bake is a family-style side dish of potatoes flavored with creole seasoning, onion, garlic, and lemon baked. Peel potatoes and cut into bite-sized pieces. Place potato pieces in a large bowl. Add onion, garlic, Creole seasoning, lemon zest, lemon juice, and butter. Toss to combine. Place mixture in a lightly greased 2-quart casserole dish. Bake for 1 hour, or until potatoes are tender. Garnish with chopped parsley (if using).